One of the many reasons I love vintage style so much, is the creativity and transformation. From the make up, to the hair and the clothes, I love it all. Of course, I am primarily a 1940’s and 50’s lover, but I adore history and many different eras, including the 1920’s. I share this love with many like-minded ladies of course, but in particular, my dear friend Jess. We both celebrated our birthdays in October, so when I came across this ‘Speakeasy Festival’, which was occurring the day before Jess’ birthday, I knew we had to go! The Speakeasy Festival was a gin, bourbon and beer festival (an interesting combination!). Jess had got me into drinking gin a few years ago (my go-to beverage now is a G&T), which actually was why the festival sparked interest in me in the first place – the fact that it was 1920’s themed was a happy coincidence! Seeing as I had never tried a 1920’s look before, I thought I would write a ‘get ready with me’ style post. I have never tried finger waves or the typical ‘flapper’ make up before, and I didn’t have time to practice, so I thought I’d share with you the process and of course how it all turned out! This was booked a few months ago, so I had some time to think about what style I wanted to go for. I originally wanted to try to be as authentic as possible, seeing as when you tend to think of the 1920’s, it’s all short, drop waist dresses with fringes and beads… when in actual fact, it wasn’t really like that at all – perhaps in the movies! I know that even the typical dark lip and dark eyes were mainly for the actresses features to be seen on a black and white movie screen. I knew everyone going to this festival would dress in the same stereotypical way and I wanted to be a bit different! Sadly, this didn’t quite work out as I was on a low budget and had nothing to work with in my wardrobe. I ended up going for a fringe and sequin dress from Metme on Amazon, baring in mind I would probably only wear this era once or twice, I didn’t want to spend too much on it! But I thought I would spend a little more time on my hair and make up to stand out a bit more than the stereotypical crowd. Despite this, I thought I would share with you a few links I had found to help with my authentic research. I asked a vintage style Facebook group of any good ideas for a true to era dress and Gatsby Lady came up a few times; these dresses are stunning but also a little pricey! The other place I found this way was La Vie Delight on Etsy. The designs are what I think to be true to era and absolutely beautiful. I very seriously considered purchasing one of their dresses (the very one is pictured below), but again, the cost was a concern! 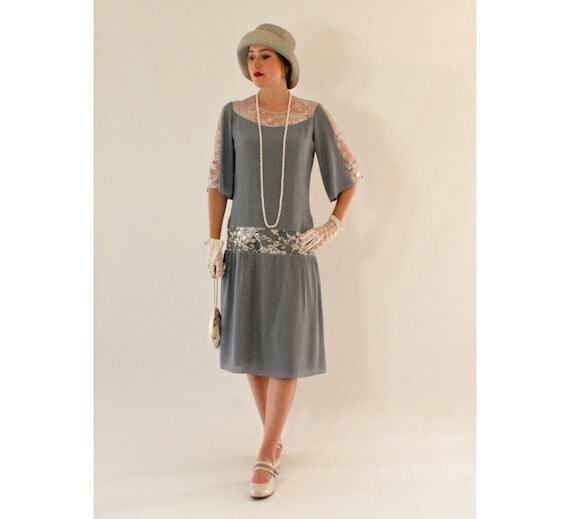 If I ever wanted to dress in a 1920’s style on a daily basis… I’d have all their dresses in a heartbeat. I did a lot of searching on YouTube for various finger wave tutorials, which were all very similar in technique; check out Miss Bee Townsend’s here, as well as this tutorial which I found quite helpful too. Cherry Dollface also has various flapper hair and make up tutorials. I also highly recommend you take a look at Karolina Zebrowska’s video about true 1920’s fashion – I adore her and her videos, plus she really knows her stuff! I began my preparations for our evening at the festival by setting my hair in a relatively normal fashion. I sectioned off the two front side sections of my hair, spritzed with grooming spray and then curled with a 3/4 inch curling iron, pinning each curl to cool. I curled the back of my hair loosely, but left it down as I would be making a low bun/faux bob. I didn’t section/curl the fair particularly neatly, but made sure my parting was straight; I just wanted some curl to create the waves with later. While that was cooling, I got on to the make up. As there wasn’t any bronzer in the 1920’s, I kept my base pretty simple with my normal foundation and concealer and applying a small amount of Benefit Hoola Lite to add some colour – otherwise I would look like a ghost! I then applied some blush directly to the apples of the cheeks, but not sweeping back as I usually do. I chose a slightly deeper blush than I would normally go for, to make it look more like ‘rouge’ and stand out more. I certainly wasn’t used to it, so I blended the edges with my setting powder to soften it a little! So instead, I didn’t fill in my brows too much, but elongated the tail and kept the front of the brow quite ‘thin’ and pointed. Then, I went back to start shaping and waving my hair. I gently brushed out the curls and, following the tutorials previously mentioned, I used a combination of my fingers and my comb to create the waves, then using wave clips to keep them in place. I repeated the process down the front sections of hair (pushing hair back and forward and clipping in place) and then set with grooming spray and hair spray. I later pinned the back section of my hair randomly to create a faux bob – this wasn’t as neat as I would have liked it, but I ran out of time and pins! I kept the clips in place while I continued with the rest of my make up. For the eyes, I wanted it to be quite dark and smoky, so I kept it simple by using a light transition colour and darkening the outer corner of my eye with a dark brown shadow on a small brush. I then lined my entire eye with a black kohl pencil and blended out a little with a small brush. This did look quite extreme until I applied some mascara and the lipstick and the look really came together! I decided to make good use of the lip matchstick samples I got from our trip to Besame Cosmetics in LA, in the colour 1930 Noir Red. Check out their website for more inspiration for era appropriate cosmetics and fragrances, plus Voodoo Vixen are a stockist here in the UK too! Once I was ready to take the wave clips out, I pinned the side sections of hair back to add to the ‘faux bob’/ low bun I had pinned previously. They waves clips (bought of Amazon) had left a little dent where they had been placed, but I didn’t mind so much as they almost added the ridges of authentic finger waves! We had a fantastic time, drank some really nice cocktails and gins and danced the night away to the (not so era appropriate, but good nevertheless) swing band! If you see the Speakeasy Festival coming to a town near you, check it out, we had such a good time! What did you think of my 1920’s look? Have you done a Gatsby/Downton Abbey/flapper look before? Prev The ‘Vintage Boxed’ Subscription Box!